While still a child, Michael's family moved to Elkridge, Maryland. His grandfather had become a lieutenant in the Howard County Police Department, and relocated his family to an 18th century colonial home, located directly adjacent to the Patapsco State Park, on the banks of the Patapasco River. It was a logical move for Mr. Kradz, and the new house provided both security and room for his family. The house needed extensive repair work, and the task of clearing out the clutter and repairing the house would become on ongoing project for several years. Sifting through the many objects in the house, they came across the several of the fully working shutters and a number of other historical artifacts, as they worked to restore the building to its former glory. The shutters were repaired and placed back on their original anchors, and the original fenceline was restored. Mr. Kradz recovered several sections of the original wrought iron fence from a salvage yard, where they had lain since the early '30s. He purchased and refinished them, and working from old photographs, restored the look of the house at the turn of the century. 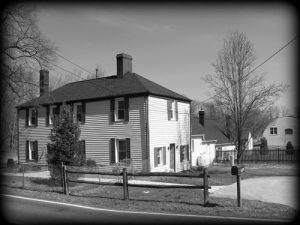 In doing research for the restoration, Mr. and Mrs. Kradz began to learn the history of the house, and of the Patapsco area. Elkridge, originally named Elkridge Landing, was first settled in 1690, and served as the gateway port for shipping agricultural and manufactured goods to and from the fertile Patapsco region. 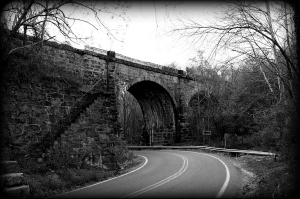 The house was once part of a plantation, and the Thomas Viaduct, the oldest keystone bridge in the U.S., and the world's largest multiple arched stone railroad bridge built in an arc, was completed in 1835 immediately adjacent to the house. 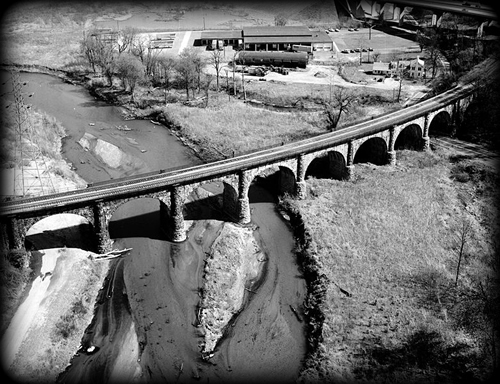 The original Tom Thumb steam locomotive took a trip across the Thomas Viaduct, and the bridge is still in use today. Research revealed that Levering Avenue, the street upon which he lived, was named after the sea captain responsible for taking Napolean Bonaparte to Elba. The Captain brought back with him several seeds of an elm tree native to Elba, one of which was planted at the corner of the property. Construction on the main house began in 1723, with additions to the house occurring in various stages until 1763. 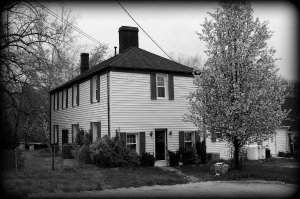 Built from the ballast of slave ships, the house was a stopping point for clipper ships coming up the Patapsco River. The house featured several tunnels beneath it, which at one time led to a dock upon the river, and to a stairwell on the side of the Thomas Viaduct. 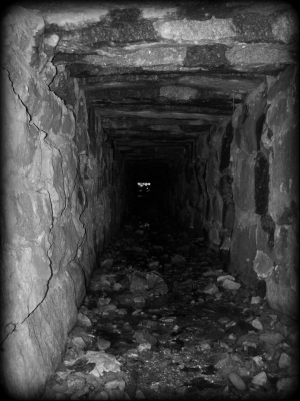 Further research seemed to indicate that these same tunnels were later used as a stop in the Underground Railroad, providing escaping slaves a temporary refuge in their flight to the north. This was just one of the interesting aspects of the house and its place in early American history. Michael's grandparents would uncover a good deal of history relating to the house in the years to come. Little did they know the impact the house would have on their own personal history, or how these events might play a part in the phenomena experienced there. 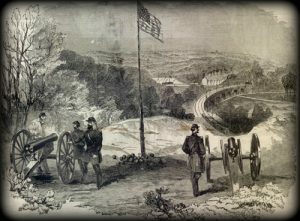 One of the many surprises within the house's long history was its depiction in a woodcut of the Battle of Relay during the Civil War. Michael came across this print in his fifth grade history book. 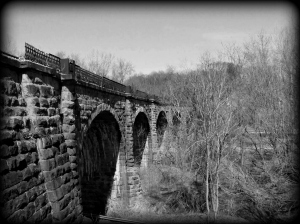 The house and the Thomas Viaduct had played a key role in several historic events, and awakened within the young author-to-be a fascination with the past, and an appreciation for history. Within a few months of moving into the house in Elkridge, members of the family began to experience events they could not explain. At first, these experiences were sporadic and easily dismissed: objects left in an empty room would vanish, only be found in other locations, strange noises, such as closing doors, or very low volume voices, were heard, and Michael and other members of the family would often experience sudden cold spots, along with the feeling of being watched. These experiences, while unusual, did not immediately cause concern, as they rationalized them to be the result of human error, or somr other natural cause. However, as the family restored the house, these experiences intensified. Michael awoke one night to discover a pair of apparitions at the foot of the beds belonging to both himself and his brother, who shared a bedroom on the second floor. The figures were of an elderly man and woman. Both were smiling, and radiated a sense of comfort. Michael related his experience to his grandmother, but his report was dismissed as a dream. It wasn't until the events began to escalate in frequency and intensity that his story was taken seriously. Michael, as well as his grandparents, began to experience a range of phenomena. Taken alone, these experiences could be dismissed, but as time went on, the family began to experience these phenomena together. Phantom footsteps, cold spots, doors appearing where no doors existed that would then vanish, and glowing lights were all experienced by different family members. Side view of Michael's childhood home, Elkridge Md. Although the family regularly experienced such events, discussion of these phenomena outside family circles was discouraged, for it was his grandparent's view that knowledge of such events would damage his reputation, and reliability as an expert witness. As a result, Michael was forced to keep such matters confidential, which he often found difficult, considering his age. The occurrences continued to escalate, and later, Michael witnessed the presence of a large, humanoid entity that was solid black in appearance, standing at the end of a hallway on the second floor. Within days, the house was struck by a ten foot high wall of water, and trapping the family inside. As the water level rose outside, Michael, his brother, and his grandfather raced to retrieve important legal documents, while his grandmother gathered the rest of the family on the second floor. As Michael made his last trip up the stairs, all the windows in the living room collapsed at once, and large jets of water began pouring through them. Tanker trucks from a neighboring trucking company were caught in the currents. and bounced off the house's thick brick walls, which, according to research, had been built from the ballast of slave ships. His grandparents took turns signalling Morse Code from Michael's bedroom window with a flashlight, as Michael watched the water slowly rise up the staircase. After several hours, the family was discovered by Jessup Rescue, and Michael and his family escaped through the second floor window into a boat, which then ferried them to safety. 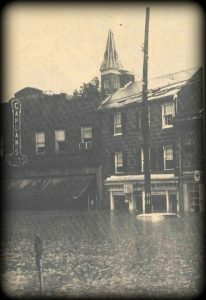 Flood waters in Ellicott City, Md. After being rescued from the rising flood waters, Michael and his family spent the night in a National Guard Armory, which served as a rescue shelter. 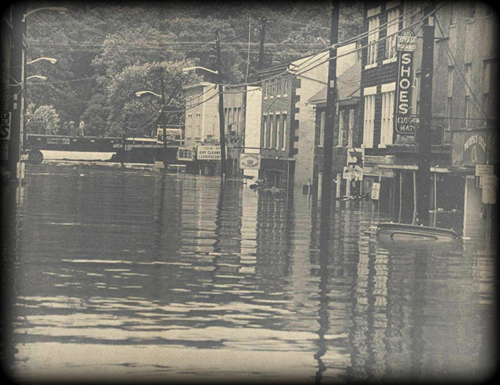 The flooding of the Patapsco River was devastating to both Elkridge and Ellicott City. It took ten days for the water to recede far enough for the family to return to the house, and begin repairs, a process which took several years. During this time, they were subject to more strange noises and the occasional apparition. Again, as the house was restored, these encounters seemed to escalate. Then, Michael again witnessed the dark figure he had encountered three years earlier. 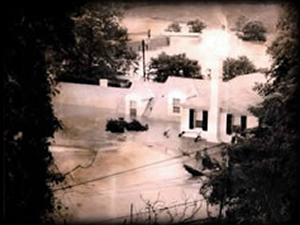 Within days, the house was struck by another hurricane, and the house was filled with water for a second time in less than four years. The family had more warning the second time, and evacuated the house before the river flooded. 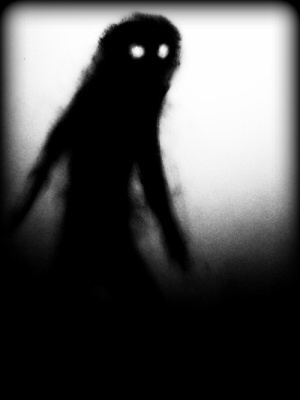 It would be several years before he discovered sketches of the entities he had seen, similar to those he drew from memory, and learned others had encountered these entities, known as Shadowpeople. Further research revealed they were normally encountered during times of natural disaster, and had been linked to the Mothman appearances in West Virginia, and other locations throughout history. 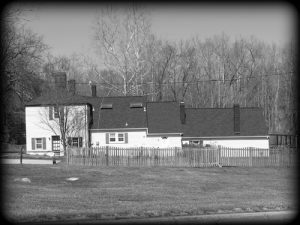 Michael's paranormal experiences did not end with the family leaving the house in Elkridge, however. Since that time, Michael has continued to have strange experiences, both as a teenager and as an adult. He now believes exposure to such events, over time, not only changed his perceptions of reality, but his sensitivity to such phenomena. Since living in Elkridge, he has also experienced a number of precognitive events, in both waking and dream states. In August of 2002, he dreamed he was involved in an automobile accident in which he was ejected from a rolling vehicle, one he had never seen or ridden in previously. This dream repeated itself for three days. On the third day, while traveling through Denbeigh, Virginia, the Ford Escape in which Michael was a passenger, was sideswiped by an eighteen wheeler, and then struck in the rear by a speeding van. The Escape flipped end over end twice, and rolled four times before Michael was ejected through the sunroof in front of the vehicle. Although severely injured, Michael credits his survival to the dream. According to insurance investigators, Michael "stood a better chance of winning Lotto twice" than surviving. Michael continues to experience the effects of that accident today. 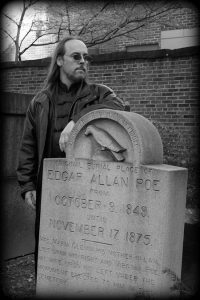 Author at Poe's tomb, Baltimore, Md. Today, Michael continues to research strange and unusual phenomena in order to better understand those experiences. 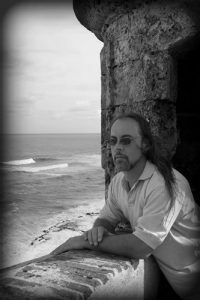 It is the Author's personal belief that 'supernatural' and 'paranormal' phenomena have their origins in aspects of our physical universe that we do not yet understand, and continued investigation into these phenomena will eventually lead to greater intellectual and spiritual understanding of our reality. "I don't expect everyone to believe these things have happened," Michael admits, "because until they happen to you, it is a very difficult thing to believe, and once it does, it changes you forever." Only a portion of the events he and his family have experienced have been detailed here. Michael plans on writing a fuller account of his experiences in an autobiography at some point in the future. For now, he uses the insights gained by these events not only to broaden his view of the world, but as inspiration in his writing.